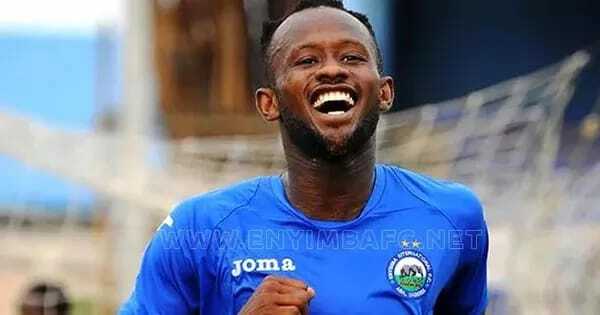 Enyimba International FC star striker, Mfon Udoh has expressed his gratitude to God after winning the CAF Champions League top scorer award. CAF awarded Udoh the award after last weekend’s final between champions Mamelodi Sundowns and Zamalek SC of Egypt. The Peoples’ Elephant failed to qualify for the semi-final of the competition, but the nine goals scored by Udoh was good to fetch him the top scorer award. Reacting few days after winning the award, Udoh said: “Words alone can’t express my gratitude to God Almighty for his grace upon my life. Awesome God,” Udoh stated. The 24- year-old forward currently holds the record for the highest number of goals scored in the Nigeria Professional Football League (NPFL) 2013/14 season.